Deb's Cup of Tea: Things you find in the yard. In clearing the weeds, I found a few items clearly dragged into the brush by the raccoons who consider my garbage the equivalent of Old Country Buffet. This was a bread wrapper. This used to be around a bar of chocolate. I think this was from Taco Bell from a trip to Iowa. There's a stray cap off a bottle of beer that somehow missed the recycling can, and a very faded empty Dr Pepper can. Remember October's raccoon on the roof? I found the small green ball I used to pelt him until he decided it was merely annoying and just watched me. I tossed that into the house and Mija immediately chased it somewhere into the living room. I also found this. Did I pelt that raccoon with this or is this a long neglected item? I picked it up and it crumbled which says to me that it's been in the weeds for many seasons. Interesting, however, that the plastic has deteriorated. I was tempted to set it in a spot and just let the elements work on it to see how long before it collapsed into pieces. Carole would probably consider this a candidate for the Farktography contest she always enters. I just find it an interesting item. 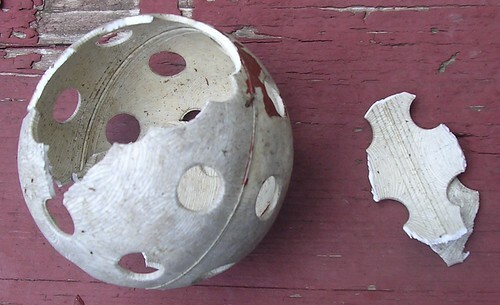 Are current wiffleballs more sturdy or will they all fall apart like this if left outside for at least one winter?